Obstructive sleep apnea (OSA) is the most common form of sleep apnea. It is characterized by frequent pauses in breathing while asleep. This type of apnea occurs when the muscles in the back of the throat relax and block the airway. These muscles help to support oral and pharyngeal structures like the tongue, uvula, soft palate, and tonsils. When the airway is either completely or partially blocked, there is usually 10 to 20 seconds of breathing cessation, which can lower blood oxygen levels. The brain panics when this happens and rouses the body to restart breathing. Generally, this is a very brief awakening that most people do not even notice or remember. It can happen over 30 times an hour all throughout the night, which significantly disrupts restful sleep cycles. The most obvious and common sign of this type of apnea is loud snoring. Not everyone who snores has sleep apnea. This type of snoring is extremely loud and identifiable through the long periods of deafening silence when breathing stops. Typically, adults and children will differ in symptoms. For example, the hallmark of OSA in adults is excessive daytime sleepiness, to the point where they may fall asleep for short periods throughout regular daily activities. Children with OSA may suffer from hyperactivity, malnutrition, and failure to thrive, which is where their growth rates are significantly reduced. The work of breathing is burning off a lot more calories. There is so much nasal and airway obstruction that it is difficult to swallow food and drink. Symptoms can be present for years without the person knowing they have the disorder. Many will have issues for only a short period, with symptoms disappearing after weight loss, surgery, or other lifestyle changes. Symptoms may also be the result of a respiratory infection, congestion, throat swelling, etc. Decrease in muscle tone, which can be caused by alcohol, substance abuse, neurological disorders, or some other underlying health conditions. Some scientific evidence suggests that snoring for years at a time can lead to the development of lesions in the throat, just as the vibrations from snoring can lead to nerve or neuron lesions all around the body. Women are typically less likely to suffer from Obstructive Sleep Apnea than men, as men in middle years are more likely to have changing anatomy in their neck and soft tissues. Women could also be at decreased risk because of the higher levels of progesterone, but they are more likely to suffer symptoms during pregnancy and after menopause. Furthermore, there seems to be a genetic component to OSA. Studies have shown that sufferers often have a positive family history. Lifestyle factors like drinking, smoking, and overeating increase the chances of developing the condition. OSA is diagnosed through a series of exams and tests. A thorough history and physical is taken by the primary care physician, which includes questioning how the patient is performing in daily activities and family history. The physical exam includes examining the back of the throat for any abnormalities, checking blood pressure, and measuring neck and waistlines. Tests used to diagnose obstructive sleep apnea are polysomnography and home sleep study sleep apnea test. Some doctors may recommend polysomnography, or in-laboratory sleep study, to be monitored overnight by a specialist in a sleep center who will record oxygen levels and frequency of breathing cessation or awakenings. When breathing stops, there are fluctuations in blood oxygen levels, with a subsequent increase in carbon dioxide. In central sleep apnea, the brain sends signals to stop breathing entirely; however, in OSA, the chest will continue to move up and down to simulate inhalation/exhalation without actually breathing. The monitors placed during the polysomnogram show chest movements are pronounced and often exaggerated in OSA patients. Hypopnea, which is when airflow is 50% decreased for at least 10 seconds, or there is a 30% decrease in airflow with a subsequent awakening or serious drop in oxygen saturation levels. 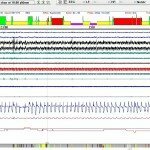 Many sleep doctors are starting to use home sleep studies, which are much more convenient and comfortable for the patient. This is a noninvasive way of monitoring blood oxygen saturation levels during sleep. Patients who are at higher risk of OSA are first given the STOP BANG questionnaire or other sleep apnea screening questionnaire, and a significant score means they likely have OSA rather than another sleep disorder. Unfortunately, home oximetry does not measure apnea events or arousals, so it could be difficult to diagnose OSA with a home oximeter. The first line of treatment for OSA is always lifestyle changes. Reducing alcohol intake, losing weight, quitting smoking, and avoiding sedative medications are a starting point for treating physicians. However, lifestyle modifications do not always resolve the issues; therefore, one or more of the below options are considered in treatment plans. Next to lifestyle changes, continuous positive airway pressure (CPAP) treatment is the frontline of treatment. It is most effective for moderate to severe symptoms. This resembles, but is different from, a ventilator. A facemask is attached to a tube that is connected to a machine, which continuously pushes positive airway pressure into the breathing passages. This helps to keep the airways open. Variable positive airway pressure, also known as BPAP, is another type of ventilation, but instead of continuous airway pressure, the machine uses a circuit to monitor breathing and provide two different pressures: one for inhalation and one for exhalation. The inhalation pressure is higher than the exhalation pressure. This treatment is more common in patients with serious respiratory conditions. This bandage-type device is placed over the nostrils to enhance the person’s regular breathing cycles, create positive airway pressure, and prevent obstruction. This is a device commonly used in mild cases of OSA. Splints or other oral appliances are sometimes used in conjunction with other treatments. Patients often prefer them because they are less “invasive” than CPAP, but sometimes they do not work as well. These splints are mouth guards that keep the passages open and protect the teeth and gums. It holds the lower jaw down and forward to keep it in a more forward position, while simultaneously holding the tongue further away from the airway. This option is used for patients who cannot tolerate the CPAP machine. This system senses respirations and stimulates the hypoglossal nerve with electrical currents to increase muscle tone, which will help avoid the tongue collapsing to the back of the throat and blocking the airway. The apneic and hypopneic events associated with OSA cause a fight or flight response in the body, which further creates a hormonal reaction. Excessive use of this response can put an undue amount of stress on the body, exhausting the glands and organs that are activated during the fight or flight response. This, paired with consistently low oxygen saturation levels, can lead to long-term dangerous health consequences. One of the most serious concerns of untreated OSA is cardiovascular disease. Sleep apnea patients are at 30% higher risk of heart attack and heart-related death than those without the condition. Increased pulmonary pressures to the right side of the heart, a major concern in prolonged cases of OSA, can result in cor pulmonale, a very serious and dangerous form of congestive heart failure. Obstructive sleep apnea and very loud snoring may seem harmless at first, but it can lead to a laundry list of daytime symptoms and more serious and extensive health concerns, so diagnosis and monitoring should be a priority. I had a sleep study and my oxygen levels started dropping during sleep but the doctor said something else was going on with me, but it wasn’t sleep apnea. Turns out, my walking oxygen levels were 70 and even lower during sleep. No machine was given to me but I have to have oxygen while I sleep. Turns out I had pneumonia and didn’t know it. I still have to sleep with oxygen every night. CPAP really is the first line treatment option for patients with moderate and severe sleep apnea. Oral devices can work very well for people with mild and moderate sleep apnea. Also the cuddle Factor has been super ruined! My husband snores a little but has never stopped breathing according to me, however according to his sleep study it happened 39 times while he was there, but not ever with me in 20 Years???! Give me a break! I feel like they just want to put one of those machines on anyone that asks for a sleep study! I feel like I should ask for one next week even though I have no trouble sleeping! But I guarantee I stop breathing 30 times over the night. FYI my husband it has only just now taking a sleep study where they claim he does not breathe while he sleeps! I sleep with him for 14 years and I’ve never noticed this?! Come on exclamation point Are you seriously just trying to get everyone Last patient all drugged up so they can go to sleep? And what about these people’s families? I have many friends who are single parents and use these machines to go to sleep every night because sleep studies have said they need them in order to sleep! However they cannot wake up in a timely manner in the case of an emergency and this scares the hell out of me anybody have any thoughts?! So, my husband has sleep apnea,per yourguidelines, and there’s a fire in my house and because he has a sleep apnea machine now and now has to take sleeping pills in order to tolerate it,and I’m a hard sleeper already, which also means we’re all going to die if there is any kind of emergency,right? How many of your patients have died because of Fire, gas leak ,Etc because they have not been able to wake up during these events!